With a unanimous Supreme Court order in hand, the State Bar sent out dues bills last month requiring active attorneys to pay additional funds to resuscitate a discipline system the justices said "has been recognized as one of our nation's finest." A special assessment of $173 is expected to generate about $22.3 million to be used exclusively for discipline-related activities. It was clear, however, that it will take several months to get the moribund operation moving again, and even the new infusion of money will support only 65 percent of the bar's previous regulatory activities in the discipline arena. The court appointed retired appellate Justice Elwood Lui of Los Angeles as a special master to oversee the fund. It will be up to Lui, who combines a record of complex dispute resolution and public service with a background in both law and accounting, to determine the timing and nature of the expenditures. Bar executive director Steve Nissen, who had high praise for Lui, estimated the new funding will enable the bar to fill about 200 jobs, ranging from attorneys to investigators to clerks. It is unclear how many laid-off employees will return, however, and the level of staff expertise is a key factor in how quickly the discipline operation can begin to function. State Bar officials readied a new dues bill which they hope will be successful now that elections have produced a new legislature and a new governor. The 1998 fee bill was vetoed by Gov. Pete Wilson and no new bill made it out of the 1998 session. Bar President Ray Marshall said his goal is to introduce a bill early this year to win funding for 1999 as soon as possible. "Ideally, I would like to get a bill with bipartisan support that will address the issues that are out there," he said. It is unclear if the bar can marshal the previously elusive two-thirds majority required for urgency legislation. It also could seek a special session, which would be convened by Gov. Gray Davis. Bills passed during a special session need only a simple majority to take effect 90 days after the special session ends. However, Marshall said it is difficult to justify such a move without first trying to win passage of legislation following normal procedures. Budget figures were not complete at the end of the year, but Marshall suggested to the bar board of governors that it seek dues of $395, a reduction of $63 from the bill Wilson vetoed in October 1997. 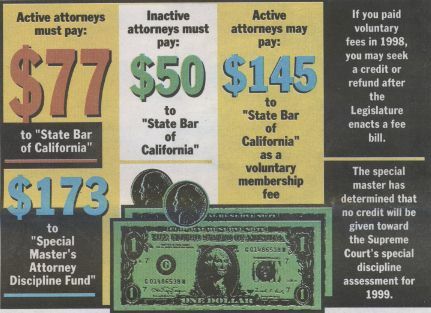 At press time, Marshall said that State Sen. Adam B. Schiff, D-Pasadena, immediate past chair of the Senate Judiciary Committee, and Assemblyman Robert Hertz-berg, D-Van Nuys, who carried the bar bill last year, will be joint authors of the bar's 1999 fee bill. The bar president also emphasized his intent to work closely on the bill with Assembly Speaker Antonio Villaraigosa and Senate President Pro Tem John Burton. The selection of retired Court of Appeal Justice Elwood Lui to oversee a special assessment for attorney discipline seemed to please State Bar friend and foe alike. Bar executives, the governor's office and legislators universally hailed the appointment as a good choice. State Bar President Ray Marshall described the special master as "an oustanding jurist, a good fellow, very bright and knowledgeable about the bar." A Republican named to the bench by Democratic Gov. Jerry Brown, Lui is widely respected, with a reputation for being fair-minded and without political bias. In naming him its special master to oversee the discipline fund, Chief Justice Ron George wrote that Lui "brings to the role of special master an in-depth background in the law, accounting, public service and complex dispute resolution."